Fun or None? Trilogy Thursday! 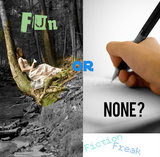 ~Jennifer~ | 10:50 PM | fiction freak | fun or none hop | trilogy thursday Please comment! Day 5 of Fun or None hosted by Nikki @ Fiction Freak ! Trilogy Thursday ~ I pick three trilogies to rate and write about three things I love about each of them. What three trilogies would you choose and what do you love about them? ~Jennifer~ | 11:00 PM | fun or none hop | what wednesday Please comment! Day 4 of Fun or None hosted by Nikki @ Fiction Freak ! Basically, I could not have been any more shocked--and not in a good way--when Bella became pregnant with Edward's baby on their honeymoon AND the baby rips out of her like a scene from Alien. Not cool. Ummm...yeah...I'm pretty sure my heart stopped beating when I read Katniss had to go back into the arena. I was devastated, appalled, completely shocked. I was lucky to know nothing about this series when I read it, so I had no idea that was going to happen. It was too much! ~Jennifer~ | 9:00 AM | epilogue review blog | poetry | prose | prose poem | weigh in wednesday Please comment! OK, so since I'm a total nerd :D, I decided to look up the words "poetry" and "prose" on the Merriam-Webster dictionary app on my iPod to help kick start my thoughts. I was really surprised to see a definition for "prose poem." (It's been a really long time since I've been in an actual English class.) In case, like me, you haven't heard of this or remember what it is, I've got you covered! Poetry tends to intimidate me unless I'm the one writing it. Sometimes I feel like I'm missing what the writer is communicating to me and find myself floundering around trying to grasp the poem's meaning, although, in my opinion, it's a form of writing that can be open to interpretation. Maybe that's what is hard for me to grasp. The more I thought about poetry in writing this post, the more I thought about my favorite songs. There are so many songs that have perfectly described emotions I've felt that I didn't have the words myself at the time to express them. There's something really beautiful about well written lyrics, and I really like to read the lyrics to an entire album I love in one sitting. I do read much more prose than poetry though. It seems there is so much more prose readily available out there than poetry. When I get emails from Goodreads, Barnes & Noble, Amazon, etc. giving out information on new releases, I rarely see any new poetry books coming out. There is so much writing in prose that is just as beautiful as poetry to me. Ninety-five percent of my favorite pieces of writing are in prose. Does it seem to you that there is more prose out there than poetry? What are your thoughts? Is it prose or poetry for you? Day 3 of Fun or None hosted by Nikki @ Fiction Freak ! There's no way I could not list the very first "real" concert I went to!! My friend's dad took us and two of our other friends (we weren't even old enough to drive yet! ), and he fell asleep while sitting next to us!! I'll never forget how the show started--the lights were turned off, and in the darkness, you could hear "Mellon Collie and the Infinite Sadness" playing, the first song of the entire album. At the end of the song, suddenly, the band was lit up, already on stage, and went right into "Tonight, Tonight." One of my best memories ever. When I finally got to go see U2 in concert with one of my best friends (and partner in U2 lovin' crime), they were on their Elevation tour with a stage shaped like a heart. What I wouldn't have given to have been inside that heart!! But to see Bono, the Edge, Adam, and Larry dancing, playing, and performing their show with such energy, and completely infusing us, the audience, with that energy--what can be better than that? Just to be in the same room with them was enough to make my day! Nothing is better than when a band comes together to bring their music to life, and you happen to be in their presence. Green Day is one of the hardest rockin' bands out there and inspires me with their lyrics of social justice and peace. My husband and I went to this concert together, and my sister went separately with her friends. This was an album that many fans of Green Day's earlier albums did not like, but American Idiot was like a salve for those of us who were shocked and appalled that George W. Bush had been "re-elected" and spoke to me in a way that gave me hope when, at that time, I had none for this country. Billie Joe, Mike, and Tre Cool played their hearts out, and we were right there with them. They give a high energy show, and they're one of the best known bands for their awesome performances. I had tickets to this concert along with a few of my friends, and Rage Against the Machine was also headlining. We had been dying to see both bands, especially the Beastie Boys. The entire tour was canceled when the drummer Mike D suffered serious injury from a bicycle accident (he needed surgery and rehabilitation afterwards), and there were a group of friends here in Ohio positively devastated! By the time Mike D was well enough to perform again, Rage Against the Machine had disbanded, and the tour was not rescheduled (this happened back in 2000). I know if we had been able to go to that concert, it would've definitely been the craziest, most memorable time any of us could've had. On May 4th of this year, Adam "MCA" Yauch died after battling throat cancer for three years. His positive energy and crazy talent will be missed. ~Jennifer~ | 2:22 AM | book review Please comment! The author graciously gave me a free copy of her book for my Kindle for review. I was pleasantly surprised by the story--after so many books have come out lately where the main character possesses some type of supernatural power, I was excited to read about a girl who can control the element of water. This was something different and fresh for me to read. The main character, Aileen Donovan, is an elemental with control over water. There are other people who also can control water as well as people who have control over earth, wind, or fire. This story pulled me in right away, and there are so many twists and turns throughout that I couldn't guess what was going to happen next. Just when I thought of a potential direction the story was going to head in, I'd find out I was wrong, which is a good thing! I love a story that keeps me guessing! 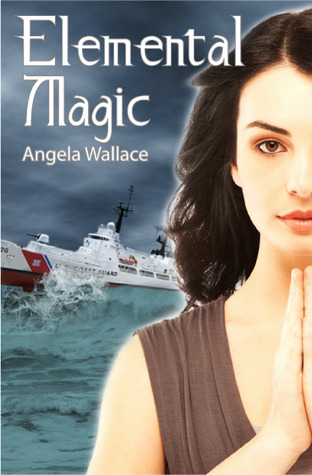 Kudos to the author for weaving a suspenseful, intricate supernatural mystery! I will definitely be reading the sequel, and as a matter of fact, I already have it downloaded to my Kindle! Fun or None? Mash up Monday! ~Jennifer~ | 12:50 AM | blog hop | fiction freak | mash up monday Please comment! Day two of Fun Or None hosted by Nikki @ Fiction Freak ! Today is Mash up Monday, where I'll pick out characters from two different books that I'd love to see in the same book. I'd like Sookie Stackhouse (from the books by Charlaine Harris that the HBO show True Blood is based on) and Evie Tremain from the novel Fated (Fated #1) by Sarah Alderson. 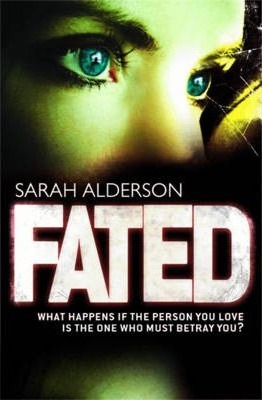 When I began reading Fated, I couldn't help but think there are some things Sookie and Evie have in common--they're both waitresses with concerned bosses and are surrounded by the supernatural, sometimes with their lives in danger. And they're also more than waitresses--Sookie can read other people's thoughts, and Evie is a demon slayer. Fun or None? Salutation Sunday! In sixth grade, I decided I wanted to become a counselor, and in junior high, I narrowed it down to grief therapy. I hurried through high school to get out of there! I went to college and earned my B.A. in Psychology by the skin of my teeth (I should've gone for a B.S. for all the good my degree is; that would be more accurate, hahaha). I plan on going back to college and getting my Master's in Mental Health Counseling. Literally from kindergarten, I knew I wanted to become a writer. I'm working on that, too. Any free time I have is spent reading and writing, just about anything and everything. I'm married (we've been together for almost eleven years! ), and we have two children--a 9 year old girl and a 2 year old boy, two cats, and a puppy. Our family keeps on growing! :) I'm currently a full-time parent and feel super lucky I can be the primary person taking care of my kids. ~Jennifer~ | 2:32 AM | camping | cooking out | memorial day | remembering loved ones Please comment! It's Memorial Day weekend, and for me, that means it's time for my family's annual trip "down home," a very rural area in Southern Ohio where my mom was raised by my grandparents along with her brothers and sisters until she was in high school. Everyone on my mom's side of the family call that area "down home," especially my grandma, and I grew up calling the area home myself. Some of the best Memorial Day weekends were when I was young, and my mother's entire, and I mean entire, family would gather at Fort Hill, one of our state parks here in Ohio. We'd eat grilled hamburgers or hot dogs, visit with each other, and enjoy how beautiful it is down there. I'd get to see all of my aunts, uncles, cousins; my grandpa's siblings, their spouses, and their kids...there were so many relatives to see and catch up with that it was hard to believe how big my family was! My sister and I barely ate anything so we could go play with all of our cousins. :D There were creeks to wade in, trails to hike, a giant open field to play baseball, and a little museum with the history of the area. One of my favorite memories about the museum before they renovated it was the statue of a Native American standing next to a deer. After the reunion at the park, we would then go to the cemetery. Back then, I only remember placing flowers on the graves of my grandpa's parents and my grandparent's twin babies, Jackie and Judy. I liked looking at all of the flags decorating the veterans' graves--each flag was brand-new and some families had a special holder specifically for the flag. Now I place the flowers on the graves of my grandpa, grandma, and mom. My grandpa gets his own flag for his service in World War II. Since it's a bit of a trip to the cemetery, this is the only time of year we visit the graves there. Once we start to see the hills, I feel closer to my mom and grandparents--it's where they lived for a long time before I was ever thought about. It isn't all sad, though. Every year we stay at the cabins, and I realize we're creating memories my two children will look back on and cherish just as much as I relish my own childhood memories. And that is what will keep me going on this bittersweet trip we're about to take. She says she'd rather be a cheerleader, which her dad and I totally support. Any school activity she'd like to participate in, we're all for it. If she chooses not to be in band, I'll be a bit sad, but I've never made her join in any school activities that she did not want to be a part of. I won't force her to be in band either, obviously. :) Besides, I always wanted to be a cheerleader when I was in junior high and high school, but I never had the guts to try out. I'd be ecstatic to see my outgoing daughter try out for something she really wants to do! If she does end up wanting to be in band, I'm really curious as to what instrument she'll want to play. I'm not even going to say anything about any instrument because I want to make sure the decision is totally hers. :) I have a feeling she won't want to play the cornet--she'll want to play something different from me. I'd be excited no matter what she wants to play! Her dad may pass out from sticker shock like my dad did, but it isn't like they make you pay the entire amount all at once. I'll have to remind him of that once I revive him with some cold water! A year or two ago, my husband suggested I start up a blog when I told him I needed some motivation to achieve my dream of becoming a writer. I wanted something that would get my writing out there and help me feel more proactive. I write in a journal, which I love to do, but it isn't quite the same as blogging for me. My journal is not for the world to read, hahaha! I guess I must not have been ready to begin yet back then, but once I began working on my blog at the end of January this year, my nervousness at opening up began to lessen. 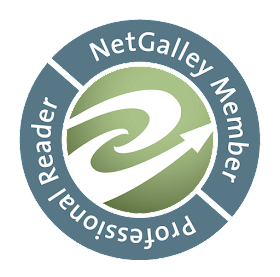 I'm happy to have a forum where many others can read my writing, and I can work on it and improve it. My only question lately has been if my blog should be targeted more specifically to a certain topic. 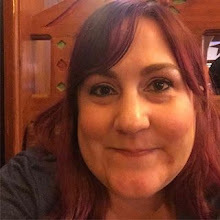 Right now, I'm writing about anything that comes to mind--stories about my children, reviews on books I've recently read and enjoyed (I want to help out indie authors as much as possible), stories from my childhood, and just about any other topic. ~Jennifer~ | 2:48 PM | Intuition | J. Meyers | Kindle | paranormal | short story | YA Please comment! On a hike up the mountain, Luke has a vision unlike any other—one that leaves him terrified. Knowing that it will come true—and that he must do everything in his power to stop it—leaves his own future uncertain. My Review: I read this story before and after I read the book Intangible--before because the events of this story take place before Intangible, and after to refresh my take on the characters. I recommend you read this story before and after also! I enjoyed the story more the second time I read it because I had more insight into Luke and Sera's personalities as well as their relationship as twins. I was left wanting more! It's funny because I had downloaded this story shortly after I received my Kindle for Christmas this year. I entered the giveaway here on Goodreads for a copy of Intangible, not realizing the two went together. I hadn't had a chance to read Intuition yet. 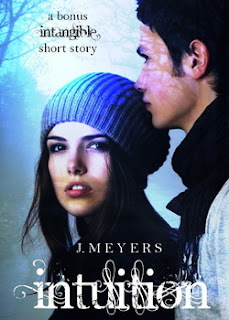 Don't forget there's still time to enter to win J. Meyers's book. Here's the link: http://www.goodreads.com/book/show/12677691-intangible . The giveaway ends on May 7th! For more information on this author, here's the link to her Goodreads profile: http://www.goodreads.com/author/show/3224031.J_Meyers .